An arcade version of Duck Hunt. Shoot the targets with the attached light gun. If you hit enough, you will move on to the next round. Rather than choosing a game mode, instead you play in three-stage rounds. Stage 1 requires you to shoot down ducks, Stage 2 is a clay pigeon shooting game, and Stage 3 is a bonus round exclusive to the arcade version. 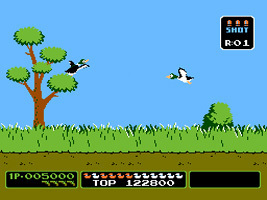 Shoot as many of the ducks out of the air as you can for bonus points, but watch out for the dog who is jumping around in the grass.